The Sport Berkey Water Filter is the ideal personal protection traveling companion - featuring the Ionic Adsorption Micro Filtration System. The theory behind this innovation is simple. The bottle's filter is designed to remove and/or dramatically reduce a vast array of health-threatening contaminants from questionable sources of water, including remote lakes and streams, stagnant ponds and water supplies in foreign countries where regulations may be sub-standard at best. The Sport Berkey is ready to use in minutes. The Sport Berkey is also easy to operate, clean, and maintain. The "Tortuous Path" structure of these pores gives it its unique characteristics. The Sport Berkey Water Filter offers a convenient and portable filtration system using medical grade technology. 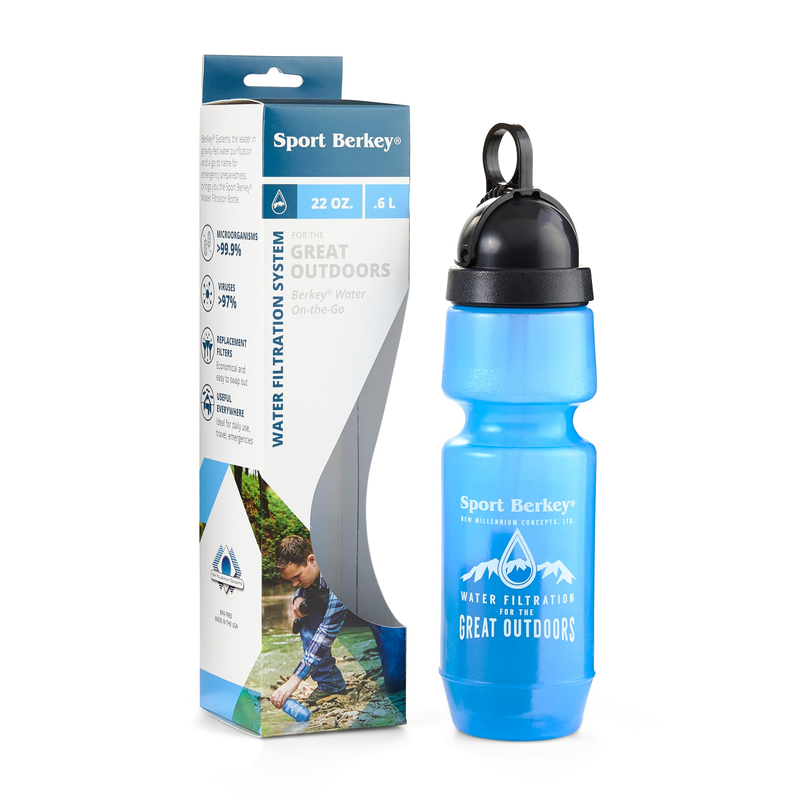 Fill the Sport Berkey Water Filter with water, screw on the cap and tighten securely to eliminate leaks. Flush water through the filter by pulling down the lever, so that the straw is exposed, and squeeze water through the filter and out the straw. Repeat this flushing process twice before drinking. This removes excess process dust from the filter. After 2 flushes, rinse the bottle and cap. Your filter bottle is now ready for use. In the rare cases that the above does not get the Sport Berkey working please try the following. Remove the filter from the straw on the inside of the bottle. Now lift the cap, straighten the pinch in the straw and stick the straw end in some water to see if the cap is working correctly. If water is able to flow then that top part of the Sport Berkey is working. Then stick the straw back on the filter and now remove the straw from the inside of the cap. Stick the filter in the cup of water and drink from the straw. If you still have a problem please contact us or your dealer. The Sport Berkey Water Filter has a shelf life of 50 years. When the filter system will not be used for an extended period, flush the unit with a chlorinated solution of 1.25 ml. per 2 liters of water. Allow to dry thoroughly with cap removed. Re-assemble and stow. Do not allow filter to freeze, do not place in a microwave oven and do not run hot water through the filter. 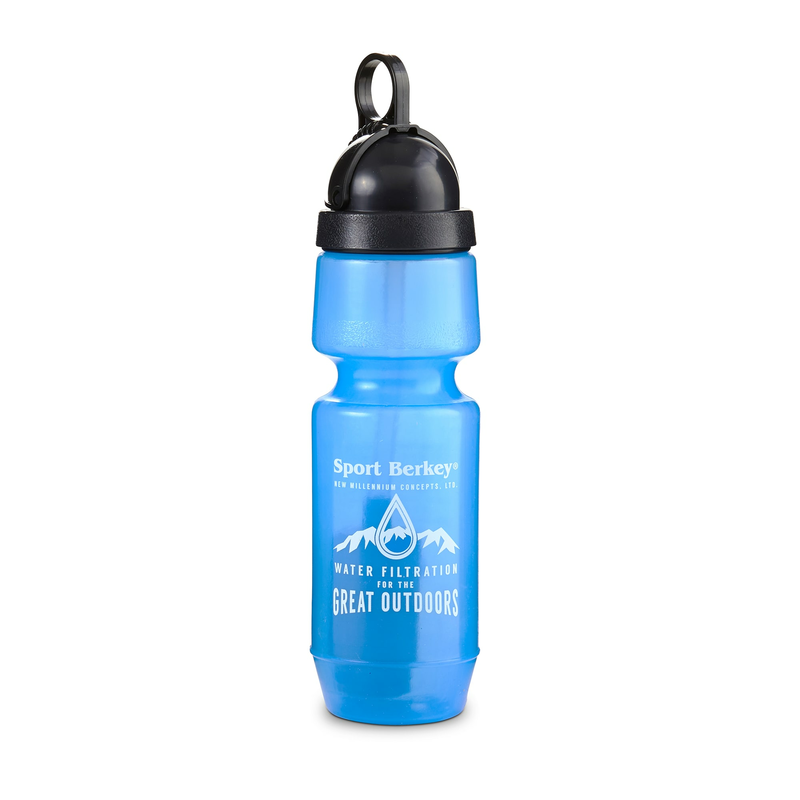 The Sport Berkey is made of BPA-free plastics. The bottle is made of LDPE (low density polyethylene) plastic, the bottle cap is made of HDPE (high density polyethylene) and the straw is made of PP (polypropylene) plastic. All of these plastics are not known to leach any chemicals causing cancer or hormone disruption.